What a weekend. I’ll get the the title of post later on but first a few other things. 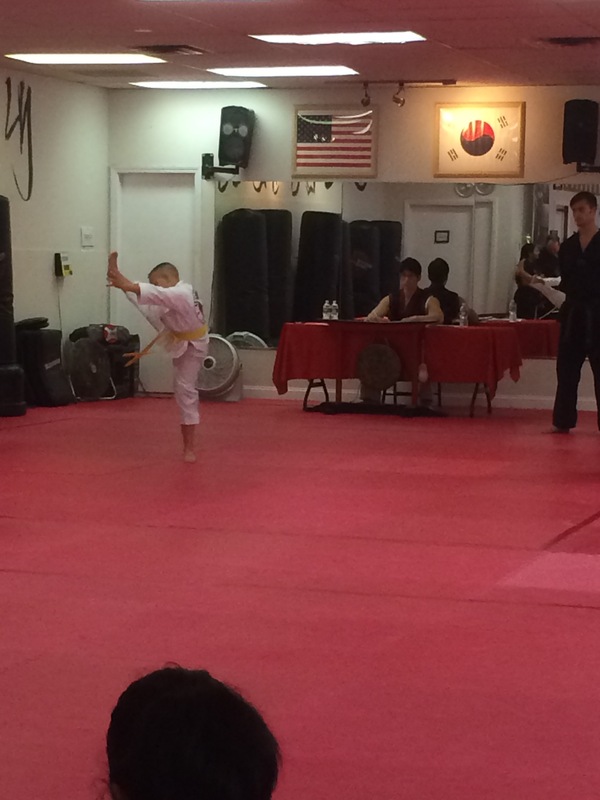 This weekend was The Kiddos TaeKwonDo Test for his Orange Belt. As much fun as it is for the kids, it is by far less fun for the adults who have to sit through it some months. This month wasn’t too bad as there were only 10 kids going for their next belt in range from White (first belt) to Blue (3 before Black). The test always starts with the National Anthem as sung by Celine Dion (yeah I know, maybe the Master just likes her) then on to warm up exercises, push ups, sit ups, jumping jacks, etc. 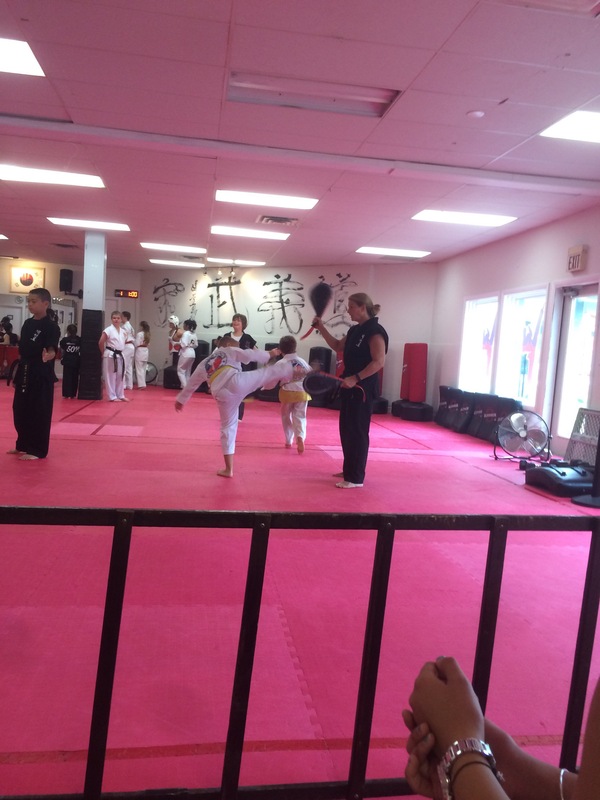 From there the class moves onto the more interesting stuff like kicks and board breaking. 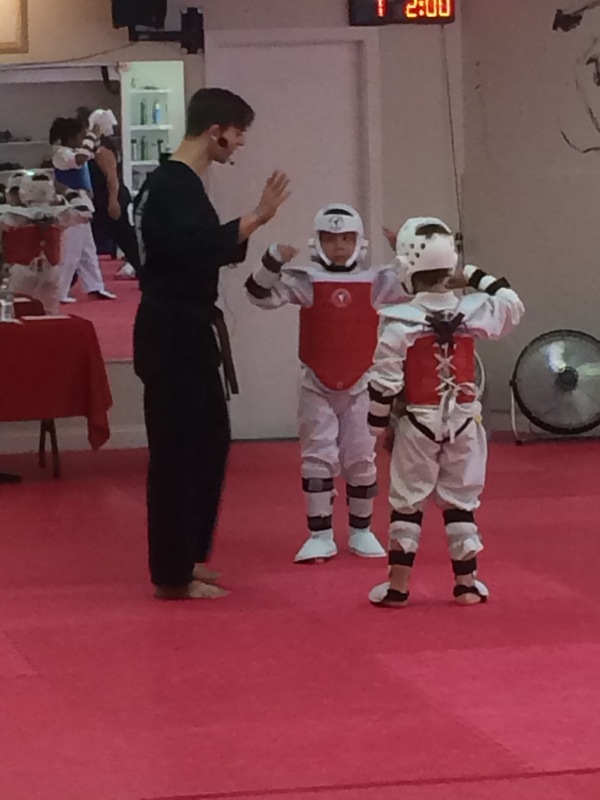 Here is the Kiddo on one of his rounds of kicking, they change the style each time the group makes a complete lap around the room to each of the 4 stations. After the group kicks and what not, we move onto the demonstration of form. In order to move up to the next belt you need to have mastered the current belts 10(ish) steps of form, I say ish because I am not really sure how many moves there are and everyone counts in Korean. 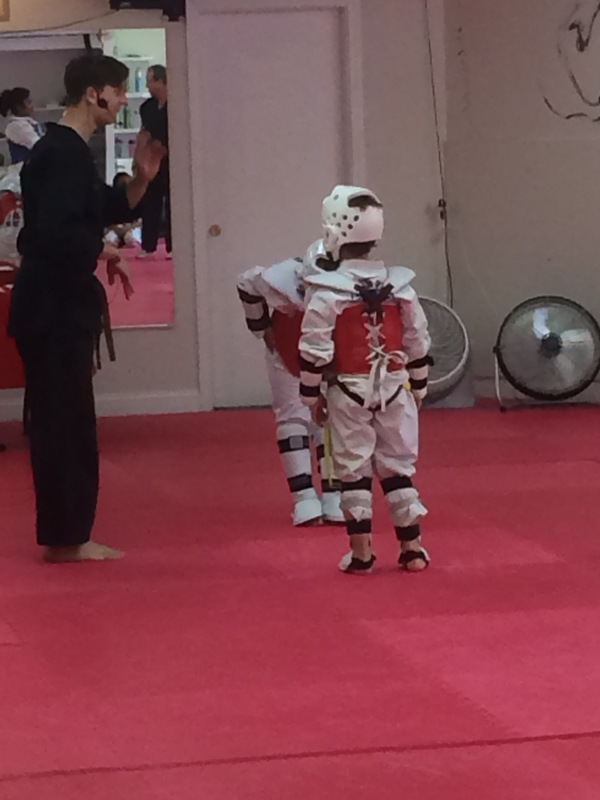 We will find out this week whether The Kiddo has passed completely or if he has to redo any of the pieces and then the following week he will be presented with his belt. 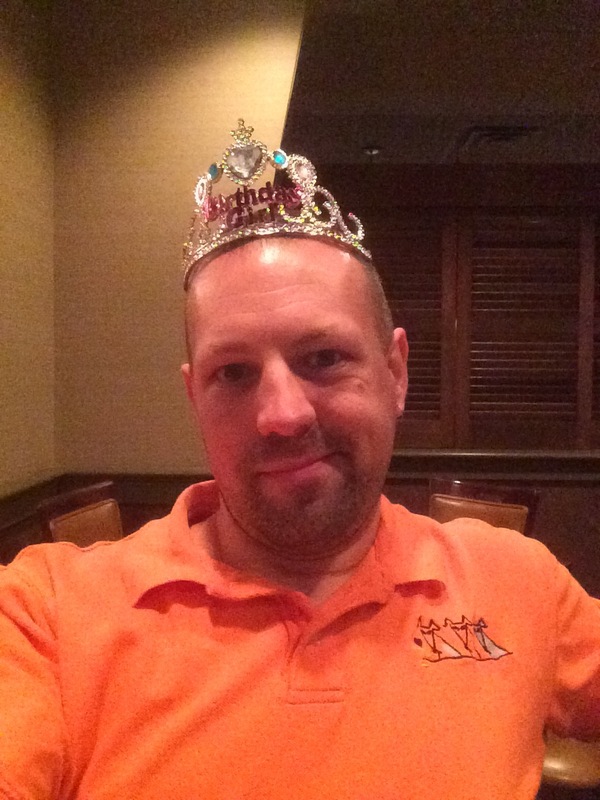 After the Belt test and our normal Saturday errands we gathered at a local steak house to celebrate our Nieces 5th Birthday. Now she had Mac & Cheese, it was her Dad (my brother) who wanted the steak. It was a nice night filled with good food, good drinks, and great company. 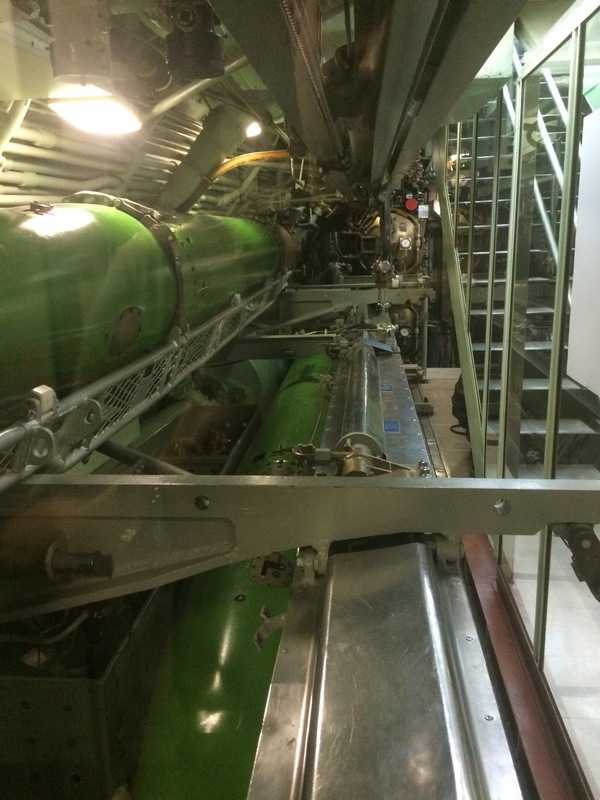 Now onto the story around the title, Sunday’s day trip over to the USS Nautilus Submarine Museum and The Hubby’s Reunion from one of the subs he was on. 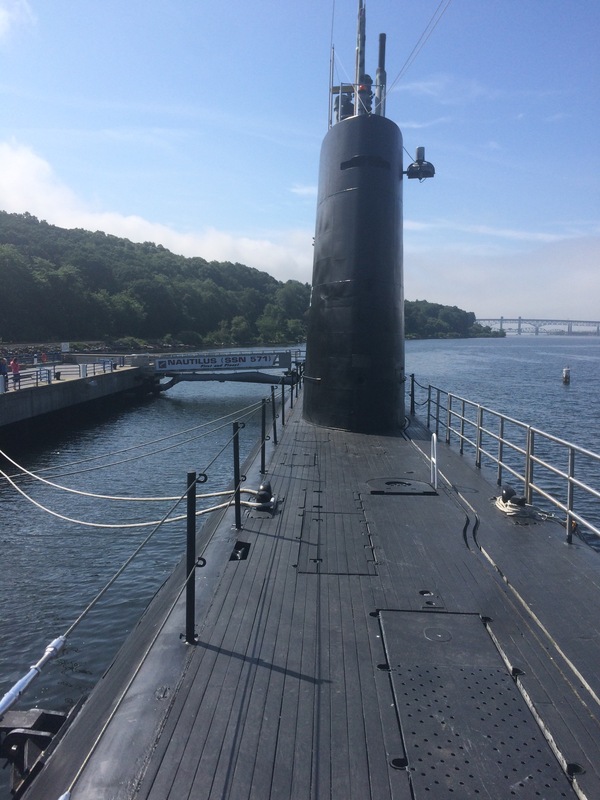 When The Hubby was in the Navy he was stationed in CT and worked at the museum for a few years so when the Reunion came up he decided we were going to go early and tour the Sub and indoor exhibits. 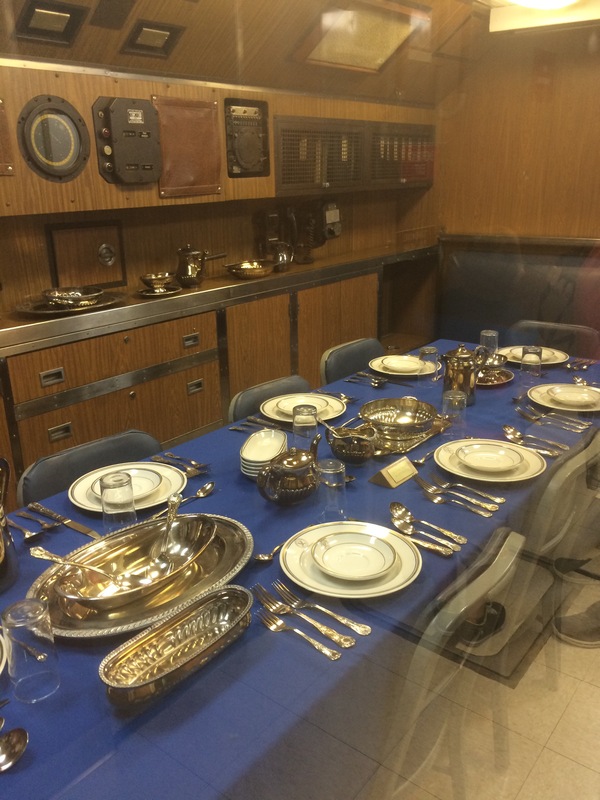 I didn’t realize they used actual fancy china on these submarines. I guess it was only the officers who got it. On deck prior to heading down into the depths of the tiny doorways and small passageways. We spent about and hour and a half looking at all there was to see and The Kiddo had a relatively good time. We then headed back into the car and made our way over to the Park that the picnic was to be held in. It was a beautiful day and the grounds had a nice playground for The Kiddo to play in. We had Hamburgers and Chips and The Hubby got to hang out with a few of his SubMates from when he was on this particular Sub. The Kiddo played and I wandered. the worst part of the day was all of the traffic we sat in on the way home. Ce la vie. Now on to a new week and 2 more parades (after having last week off from paraded I can’t complain about them), and next week we head out for Grapehounds 2015! 4th of July Weekend found us with an extra day off on Friday the 3rd, so we packed up The Kiddo and the car and headed out to our friends lake house in Sullivan County, NY for the weekend. 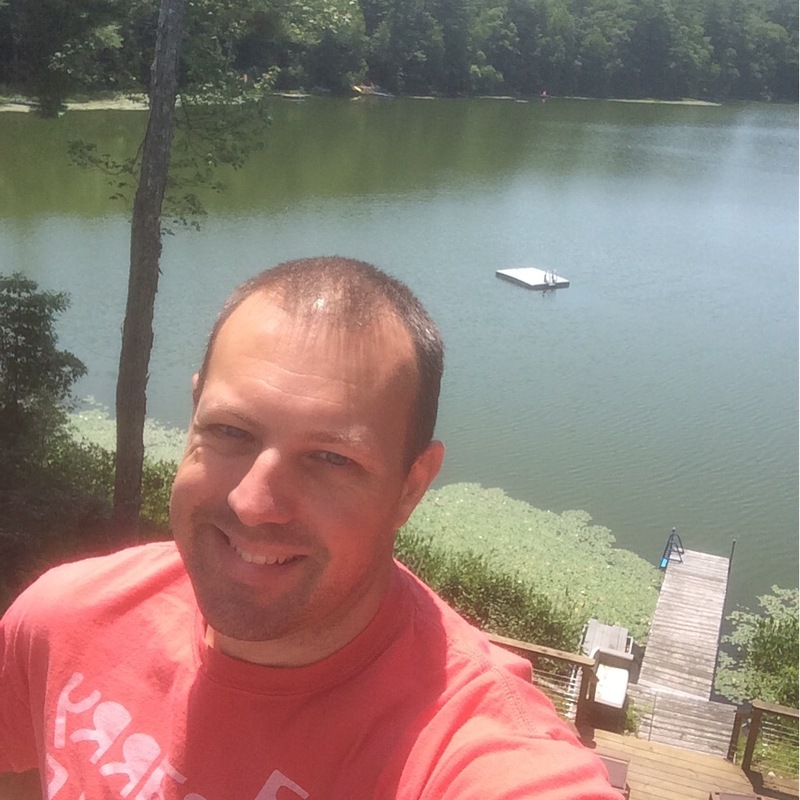 It was nice to unwind with nothing to do but eat and drink and enjoy the country air. We headed out around 9am, grabbed some breakfast and gassed up the car and hit the road. We had a few alternate routes to take to avoid some traffic but still managed to make it in time for lunch. This is the view from their deck.The house is co-owned by our 2 friends and their Brother and Sister-in-law. It’s hard to believe it’s been 10 years since it was built. It’s a 3 bedroom open air plan house with a decent size kitchen, large living room, loft off of the upstairs bedroom and a full size basement. 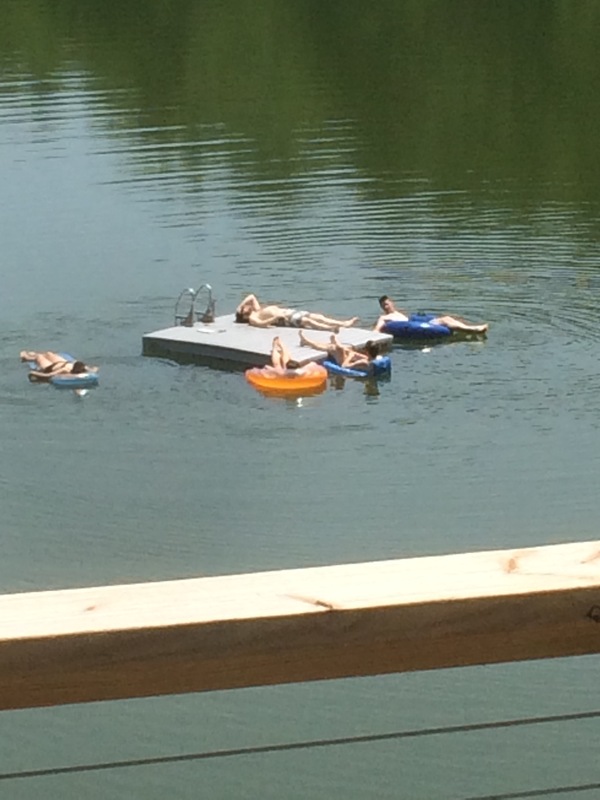 The Neighbors decided to do some afternoon floating in the lake and on our friends dock. None of us complained at all. As it would turn out we saw quite a bit of the neighbors over the weekend. Around dinner time on Friday 3 of them came knocking on our door asking if we had any spare charcoal as they miscalculated and ran out before they could finish cooking dinner. Our friends use Gas so they did one better and offered up the grill for them to use as we were not quite ready to cook dinner yet. Brock and Mike and Liza were a delight to sit and chat with while they cooked. They were each half of the 3 couples who were up from Brooklyn who crashed their friends place while they were honeymooning in France. 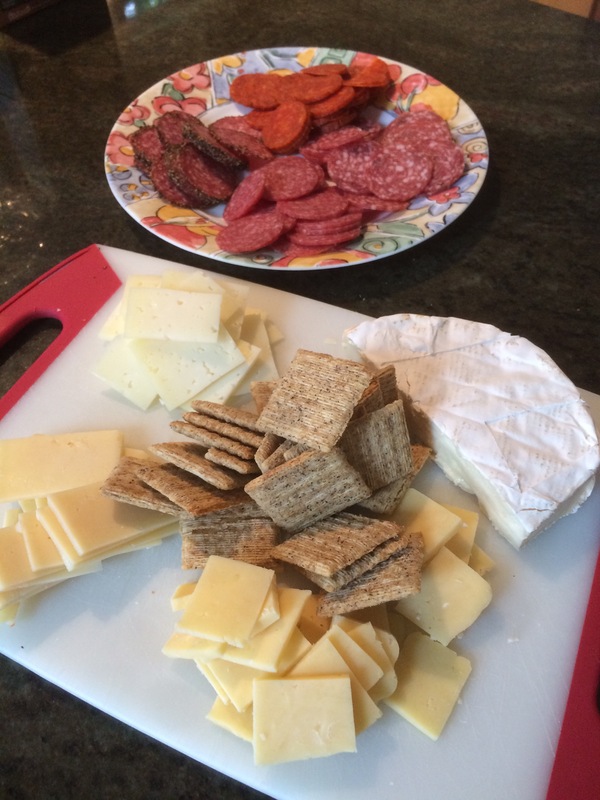 No holiday weekend is complete without a Cheese and Salami Plate. We enjoyed this on Saturday after our trip to the Farmers Market and a dip in the lake for The Kiddo and I. 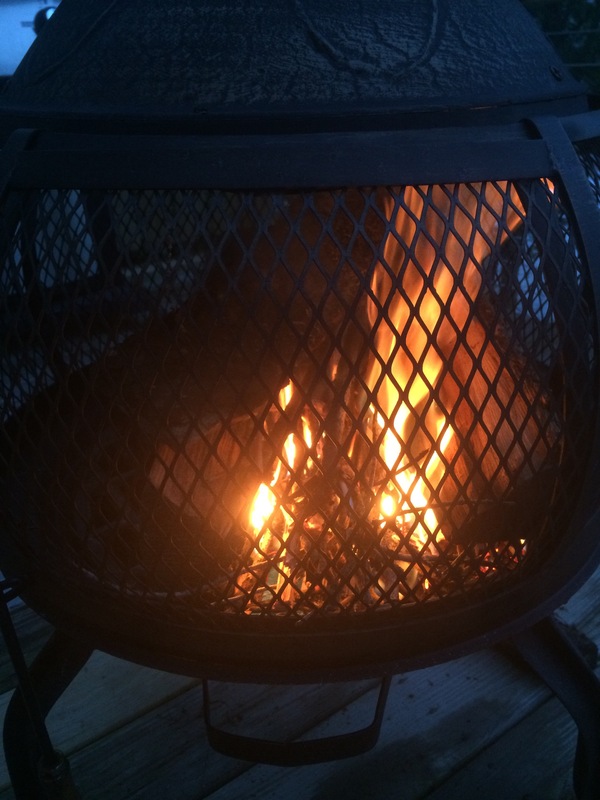 The Hubby decided he wanted a Fire to enjoy on Saturday evening. The weather all day wasn’t the best, mostly cloudy but spots of rain off and on. 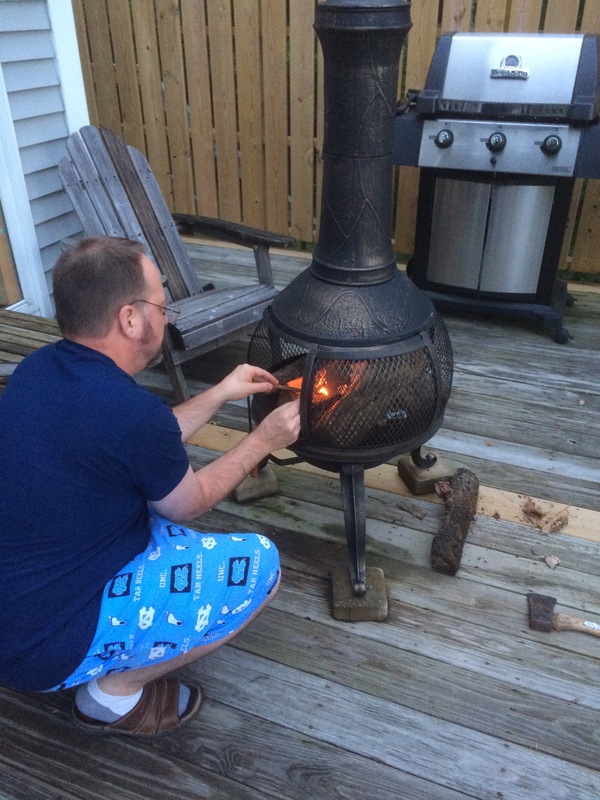 Here is my Boy Scout with his kindling going to make a fabulous fire we all sat around. Even The Kiddo enjoyed it while eating his ice cream before bed. 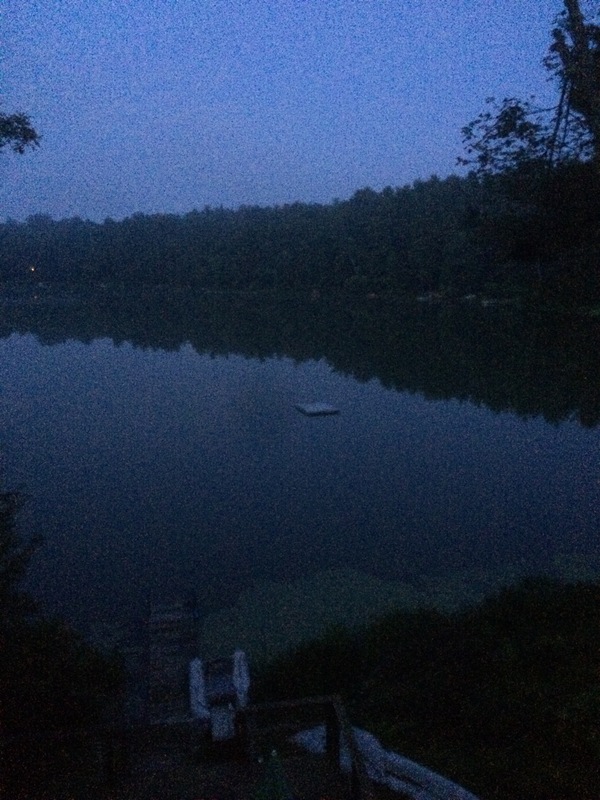 Saturday night and the lake is as still as could be and almost mirror like. 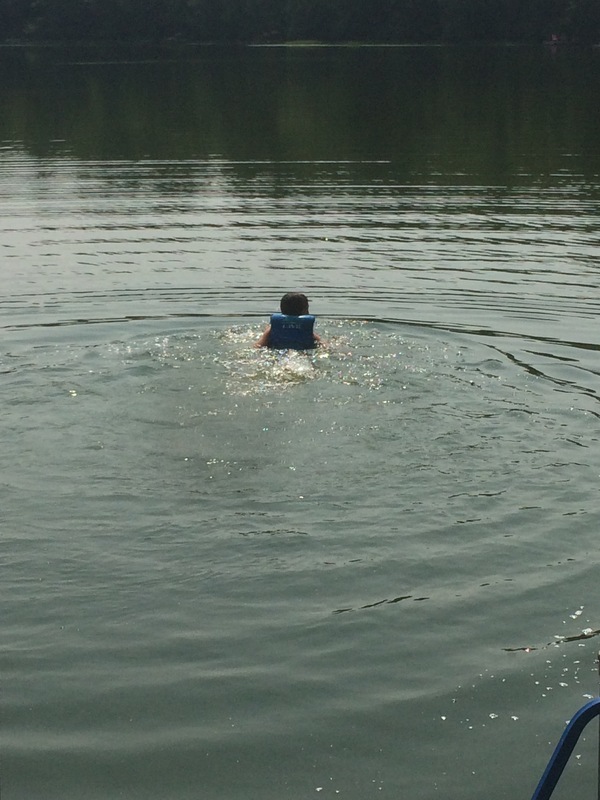 The Kiddo had to have one last swim in the lake on Sunday Morning between breakfast and lunch before we packed up and headed home. We all enjoyed ourselves and look forward to getting back up there again soon. The work week has been pretty uneventful. We have 3 parades coming up this weekend, Thursday, Friday, and Saturday night. Let’s hope the weather cooperates with us and the only moisture we have to contend with is from sweat and not rain.